Scotts Crispy Onions are produced in Coleraine, as part of the locally renowned, 60 year old, family fruit & veg wholesale business, Sydney B Scott & Sons. The family has worked hard over the last few years perfecting the product and developing it’s unique range of flavours. 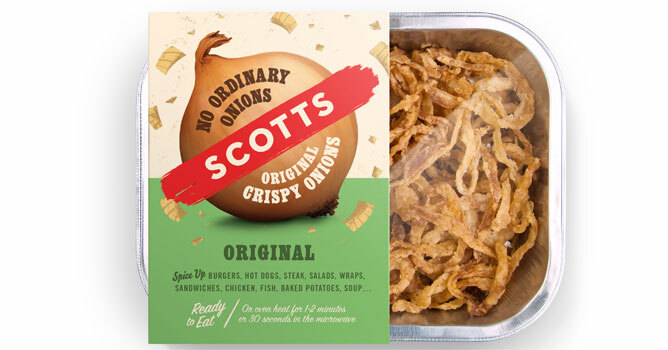 It’s fair to say that Scotts Crispy Onions are ‘No Ordinary Onions’ – taste them and see! Crispy Onions 90g available in Original, Steak, Sweet Chilli, Smokey Bacon and Curry flavour. Original Crispy Onions 175g, 400g. Chinese Salt n Chilli Snack Pack 35g. Convenience stores, independent retailers and butchers, NI and ROI. Produced under own brand for Supervalu, Centra (ROI) and Primacy Farm Butchers. Available to order online via website.